In 1997, Collage Arts (formerly Haringey Arts Council) working in partnership with Haringey Council, community groups, The Metropolitan Police and local stakeholders, launched a community festival event in the heart of the Tottenham area. Taking place at Bruce Castle Park, the event proved to be an exciting new addition to the Borough calendar of leisure activities. In 2000, to celebrate the Millennium, the plan to revise the spirit of Carnival was realised. This addition has proved to be a huge success, with estimated audiences for both events totalling over 50,000. The festival celebrated its 10th birthday in 2007. We, as a committee are committed to keeping the tradition alive for many years to come. This cannot be possible without the support of local business. The Carnival procession starts at 11am from Eade Road N4, continues through the heart of Tottenham down Seven Sisters Road, Tottenham High Road and then up Bruce Grove finally finishing the 2 mile parade at Bruce castle park at 1pm. The stages fire up at 12pm with fun packed entertainment and great headline acts for all ages, check out the food zone and taste the foods of many different cultures. 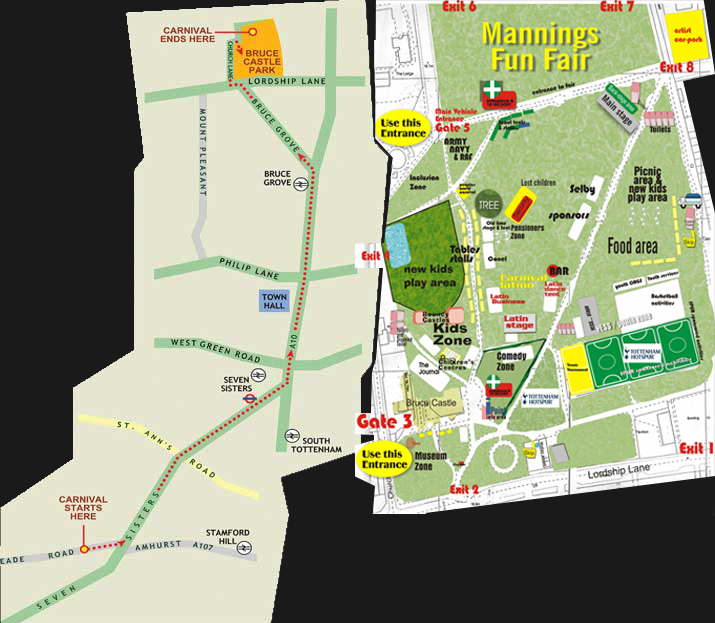 Take some Salsa dancing lessons in the Latin zone, we have a fun packed area in the Kids Zone and not forgetting the Mannings Fun Fair.